Powdery mildew is a fairly common lawn disease. At first glance, it may look like someone suddenly sprinkled your lawn with talcum powder. That powdery coating is actually billions of fungi growing on the blades of your grass. Powdery mildew most often attacks grass grown in conditions that are too moist and shady, and chemical control is often unnecessary. Only heavily infested lawns yellow and die from a powdery mildew infestation. The best long-term treatment is to change the conditions which caused powdery mildew to crop up in the first place. Cut your grass low. Aim to take off roughly the top roughly one-third of its current height. Apply a fungicide prescribed for powdery mildew, like Greencure Organic Fungicide or Ferti-lome Liquid Fungicide, to heavily infested lawns when you first notice the infestation. Spray the fungicide over the lawn according to the manufacturer's instructions at 1- to 3-week intervals until the powdery mildew is dead. 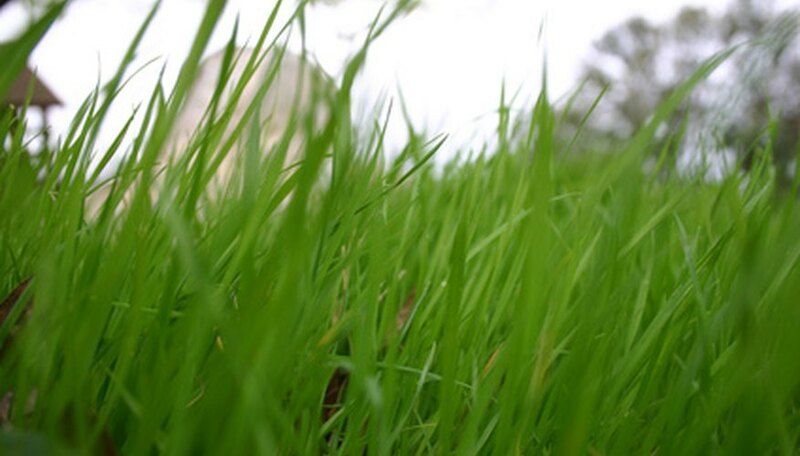 Improve the light and air circulation in your lawn. Prune back any overhanging shrubs or tree branches or move any structures that cast a shadow over the infected area. Aerate your lawn at the beginning of the growing season to reduce soil compaction which stunts root growth and weakens your grass' ability to fight off infection. Rent a lawn aerator, and roll it over your lawn. Make two passes at 90-degree angles to one another. Over seed any permanently shaded or thin patches of grass with a shade-tolerant or powdery mildew resistant variety of grass. Alter your watering schedule. Only water lawns susceptible to powdery mildew early in the morning so that the water will have time to evaporate by evening. And instead of giving your lawn several light waterings, cut down the frequency and increase the amount of water that you give your lawn each time. If powdery mildew continues to be a problem, replace your lawn with a powdery mildew-resistant variety or another shade-tolerant ground cover.